Finding gifts for gamers isn’t rocket science! 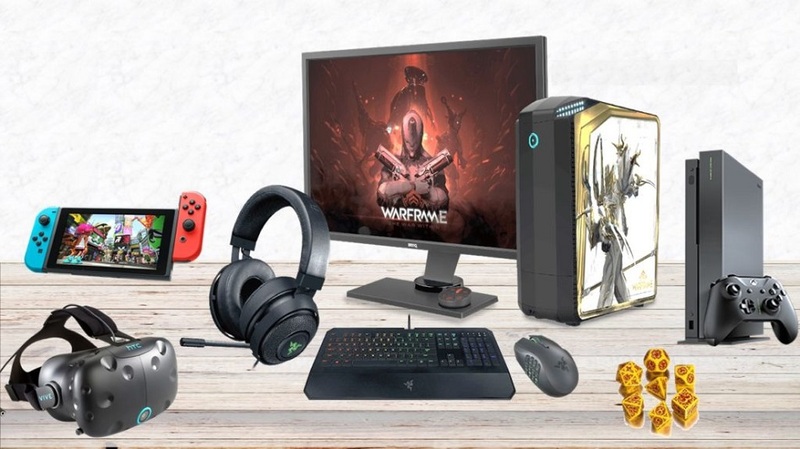 With a little help from the several hundred gamers that took our survey, we have the most comprehensive guide of the most wanted items straight from the gamer’s wishlists. Don’t get stuck gifting things that are quickly forgotten or discarded, bookmark the list now. Let’s face it, if you are anything like my family and friends, who have ZERO interest in gaming, you probably have a hard time finding gifts for the gamer in your life! As a gamer, I get it, to the outsider the gaming world probably seems incredibly foreign, but it is still lame to get bad gifts. Fret no more my friend, I’m here to help and I have the survey results from hundreds of gamers telling us what they desire most when it comes to gamer gifts! I contributed to this survey as well and I’m not surprised by the results. We list everything from games themselves to peripherals, accessories, and even to cool fan related items related to our favorite games. Now you have no more excuses for giving lame gifts to the gamers in your life! If you are gifting to a family member or friend you may not need to be too personal with the gifts you give but if you are looking for the best gifts for gamer boyfriends and girlfriends we have you covered with a special selection just for them. Feel free to skip the guide if you are already familiar with most gaming platforms. Let’s jump right in and spill all the details. Before we get into the all of the awesome gift ideas let me tell you about how we came up with this list. The survey was very simple, all that was asked was for gamers to list their Top 3 Most Wanted Gifts. This question was asked in several different gaming forums and the response was great with several hundred individual responses and represents a very diverse sample of gamers. The survey was the easy part but we analyzed all of the responses and then categorized and grouped them to be able to better interpret the data. This turned out to be quite interesting and there were some very common trends apparent in the results. It is amazing to have some many responses directly from gamers and put them all together to see the outcome! Now Before you just run out and purchase one of the first few items on the list there are just a few things you should know if you want to get the absolute best gift possible and have the gamer in your life excited about that gift. I recommend paying attention to your gamer friend or family member you are buying the gift to make a few determinations. Below is a quick list of questions to answer to help you gather the information you need to keep in mind when shopping. The quick rundown below will break it down a bit further. What is their favorite gaming platform? Do they have a favorite gaming franchise? This is one of the more important pieces of information you will need. If you don’t know your gamer’s preferred platform any gift you get may not even be compatible with their chosen platform. Luckily this is pretty easy to determine by just looking at what they game on. PC just stands for personal computer which is one of the most popular gaming devices people game on. This is pretty easy to determine and if they are doing most of their gaming on a computer than you have a plethora of options from games themselves to a host of peripherals that gamers love. Consoles are also extremely popular and usually the platform most gamers start on as it is more affordable and easier to get started on. Consoles are made by a few different companies. XBOX ONE: The XBOX ONE is a console made by Microsoft which feature two different models. The XBOX ONE X is the latest version and is currently the most powerful console on the market. The XBOX ONE S is the slightly smaller and less powerful version. Both are compatible with any game marketed for the XBOX ONE. XBOX is known for its great multiplayer games and online experience. Some popular game franchises exclusive to the XBOX are Halo, Gears of War, Forza, and Crackdown. PLAYSTATION 4: The PS4 is Sony’s console which is also available in two versions. The PS4 Slim and the more powerful PS4 PRO. PlayStation is known for its immersive single player games, although it does feature multiplayer as well. NINTENDO SWITCH: Nintendo’s latest entry into the console realm is the SWITCH which is a portable handheld gaming device also capable of connecting to a TV. Nintendo features games like the extremely popular Mario Kart and Legend of Zelda: Breath of Wild games. Tabletop have had a surge in popularity in recent years! From the ever popular RPG (Role Playing Games) like Dungeons & Dragons to strategy games like RISK, tabletop games have been around forever but it seems like there are new games coming out every day. RPG and Strategy games aren’t the only popular genre of games, Code Breaking and Mystery Games are also really popular these days. Whatever the genre choice, there a host of options gifts for tabletop gamers. Now let’s get to these survey results you are probably anxious to see! As I said previously, hundreds of gamers made a wishlist of their top 3 most wanted items. These wishlists were then analyzed and summarized for all of you. You will notice that I have only listed the results by category and the reason is there are literally hundreds and even thousands of different products to choose from in each category. Don’t worry though, after you get through all the survey results you will find the list of best gifts for each category as we did all the research for you to find out which products reign supreme. Not surprisingly, most of the products we selected were on most of these wishlists. As I said, we surveyed several dedicated gaming communities. Below is a graph of the individual surveys themselves. The graph represents the total percentage of respondents that included at least one item on their list from the categories. Now some lists could contain items from only one category or up to three different categories. As you can see, peripherals are extremely popular. You are probably wondering what peripherals were listed in the wishlists. These ranged everything from gaming monitors, keyboards, mice, headsets, and controllers for both PC and console. I’ll go into a bit more detail in moment as to which of these were most wanted. Next, we will look at the results within the survey. 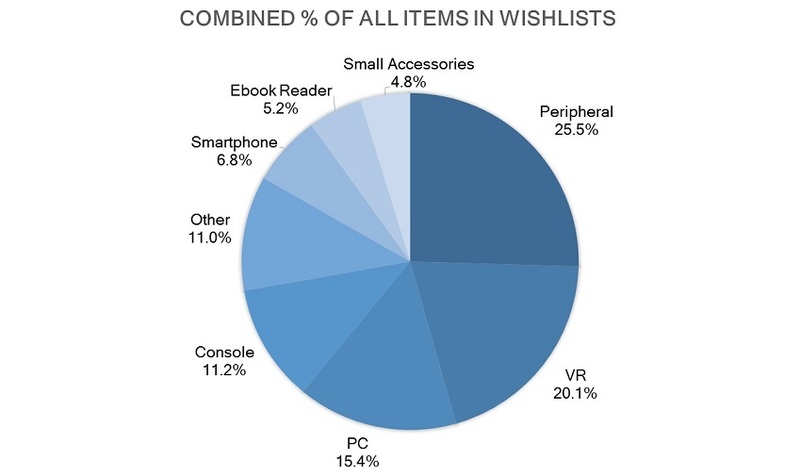 With over a thousand items total in all of the wishlists, the above graphic shows the distribution or popularity of the item categories. 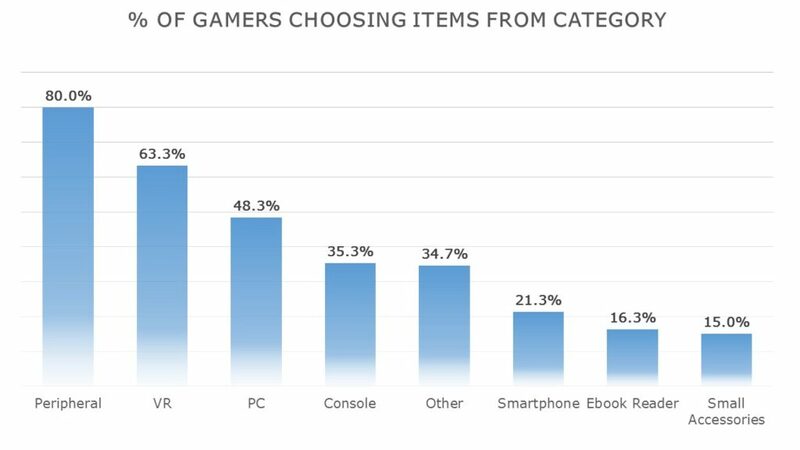 So while over 80% of participants wanted at least one peripheral, this graph shows that other categories likely showed up multiple times in the same wishlists whereas gaming peripherals likely on showed up once per wishlist. This is the last point we will go over before jumping into the lest of best gifts for gamers because of how many different peripherals there are. This can be quite an overwhelming topic but we will do our best to get right down to the ones that showed up most! There you have it! 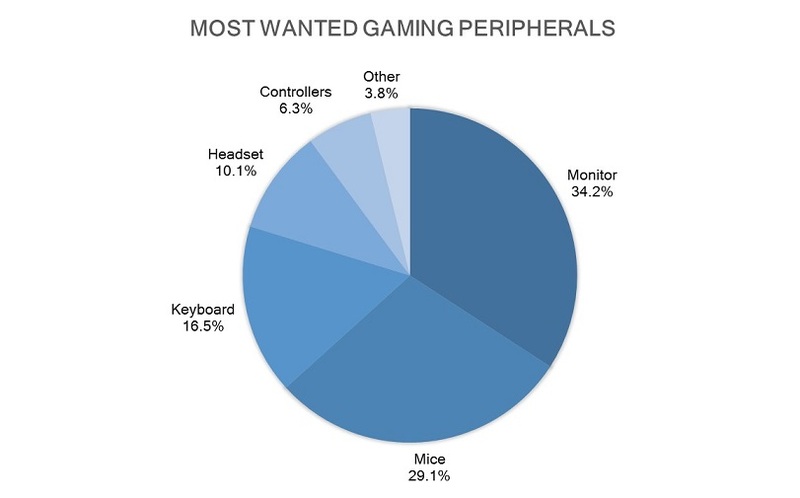 As you can see, gaming monitors are the most popular, followed by gaming mice, gaming keyboards, gaming headsets, and gaming controllers. While not really a scientific answer, this probably has to do with the price of gaming monitors compared to other peripherals. But, it is not uncommon for gaming keyboards and gaming headsets to run $200 or more. Ok, now that we have covered the results, let’s get right into the list of the best gifts for gamers! Our list is pretty comprehensive but it is organized by the most wanted items as voted on by video gamers so feel free to browse or jump down to the category of choice. You will never be at a lost for ideas again! There is a reason why gaming monitors are so popular and one of the most desired pieces of gaming equipment. Gamers are always trying to achieve the coveted “ULTRA” graphical setting on their powerful gaming machines. What good is this “ULTRA” setting without a gaming monitor capable of keeping up with the output of the PC or console? There are really only two specs you should concern yourself with when searching for a gaming monitor. You need to look for 144 Hz monitors or better with a minimum resolution of 1080p but for any serious gamer you should be looking for resolutions approaching 2K or 4K. This will allow the gaming monitor serve a long life of hi-definition gaming without fear of being outdated so soon. Finally, look for gaming monitors between 24″ and 29″ as this is typically the preferred size for gamers. Below are currently the top picks among gamers and they are also the top rated as well. Gamers would be excited to get a gift of any one of the options below! If the gamer in mind is known to favor high-end gaming gear, go for the monitors with a higher resolution with a minimum of 2K. The picks below balance price and quality but if money is no option than the ASUS ROG SWIFT PG27AQ 27″ 4K gaming monitor is currently the highest-end monitor available. On to a much more affordable gamer gift, a gaming mouse is a very accessible item to most folks. Not only is this an affordable item, but it is also something that will definitely improve someone gaming experience if they are using old outdated technology. A gaming mouse is the quickest way to improving someone gameplay giving them faster more accurate movement in the games they play. When I picked up my first gaming mouse I was surprised to see how much of a disadvantage a cheap mouse that is bundled with a PC is. The tracking is not accurate, they usually break down quickly and worst of all they do not offer any of the special features of a gaming mouse. The important features of a gaming mouse are extra buttons, custom programmable buttons, and on-the-fly sensitivity adjustments. These three things alone are what sets them apart from the standard PC mouse. The types of video games some plays will usually dictate what type of mouse they will choose. For gamers who play FPS (shooter) games like Counter Strike or Call of Duty, they usually do not need as many buttons as someone who plays MOBA games like League of Legends or DOTA which make use of the extra buttons. If you find yourself at a loss for gift ideas for gamers because the already have great gear, perhaps they lack the latest and greatest gaming keyboard. The gaming keyboard is much like a gaming mouse in that it can vastly improve a gaming experience. From the tactile feedback from mechanical key switches to the awesome and highly customizable led back-lighting, keyboards are no longer just keyboards. 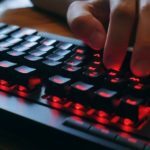 If you are so inclined to dive deeper on the topic feel free to check out the best gaming keyboard guide. The guide will teach you all about mechanical gaming keyboards and show you exactly what to look for and what configurations you can expect in different models. If you don’t have much time to read through the guide no worries, below are a few bullet points to look for. 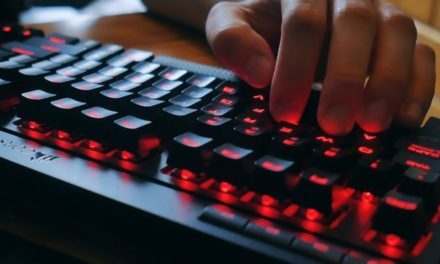 Mechanical vs Membrane: When looking for a gaming keyboard, look no further than the mechanical keyboard. These keyboards are equipped with mechanical key-switches which provide a more tactile feel and clicky sound, though some switches are manufactured to be quieter. Mechanical Key-switches: One of the most popular manufacturers of key-switches is Cherry, and you notice that the Cherry MX key-switches are used in several popular keyboards. Cherry MX switches come in a variety of styles noted by their color, some clicky some not, some silent some not, and many combinations in between. The most popular are Blue, Red, and Brown. Razer and LG choose to manufacture their own proprietary switches. Back-Lighting: Back-lit keyboards are all the rage these days and come in a variety of options. These options range from a static color like white or red, to the models denoted with an RGB in the name. RGB keyboards, mice, and even headsets are capable of displaying a rainbow of colors and most are fully customizable. Extra Programmable Keys: Just as gaming mice feature extra programmable buttons, gaming keyboards do as well. These can come in handy in just about any type of game but are most useful in RPG and MOBA games. That said, keep in mind this usually takes up more space so if their desk is tight space it may be best to pass on this feature. The keyboards below are some of the most wanted mechanical gaming keyboards. When I first started looking for a gaming keyboard I remember just how hard it was to choose, luckily for you, these are the best of the best. Personally, I went with a TenKeyless model like Cooler Master below. Keep in mind most models are available in the compact format. These days every gamer is using a gaming headset and long gone are the days of expensive sound setups crowding up your desk. Headphone technology has progressed so much that headsets now sound better than any speaker system. Some high-end headsets can even simulate up to 7.1 surround sound. Getting better quality in a much smaller footprint while being able to crank the volume up and not bother anyone around you is something everyone wants these days. Aside from the better quality, headphones also isolate you from all of the external noise which allows gamers to hear all of the nuanced sounds in game. This becomes an advantage in some games as you can anticipate enemies sneaking up behind you. Having an advantage in competitive games is what everyone looks for and headphones certainly offer that advantage. Finally, when purchasing a gaming headset, they usually have a microphone attached as well which is convenient since pretty much any multiplayer game requires team communication. This means you have one less device you need to purchase and keep track of. Just one thing you need to keep in mind when looking for a great gaming headset. Make sure the headset is compatible with the platform they are gaming on, whether it is a PC, an XBOX, or a PlayStation. Most headset are compatible with all platforms and the easiest way to check it by the connector, USB connectors are usually only compatible with PC (but sometimes consoles), and 3.5mm connections are typically universally compatible with everything. All the headsets below are universally compatible and are the most wanted headsets by gamers. These days a gaming keyboard and mouse is all the rage but for the console gamer, they currently aren’t able to enjoy the benefits. That said, even for a PC gamer, some games are just more enjoyable on a gaming controller. I personally prefer playing games like Rocket League on PC with my Xbox Elite controller or even some RPG games. For the most part, this is an easy choice if you want to give a gaming controller as a gift since compatibility is usually limited to the platform they are playing on. Where it may get tricky is when you are using a gaming pad on PC. For players using or wanting a gaming pad for their PC, both the PlayStation Dual Shock 4 and the Xbox One controllers are both capable of being used on the PC, you will have less compatibility issues with Xbox One controller since it is developed by Microsoft and they have worked hard to ensure broad compatibility with games. That said, if your gamer pal already own a particular console, it is best to stick with the respective controller as that is what they will be used to. I know I am quite fond of Xbox One controllers and that is mainly due to the fact that I have played mostly with that controller over the years. That said, the Steam controller is a great option for games on PC that aren’t really made to be played with controllers. Steam controllers have the ability to map the buttons to whatever keyboard buttons the game may use. Finally, controllers now come in a variety of colors so take a look at all of the available options and pick one that would most suit the person you are gifting to. 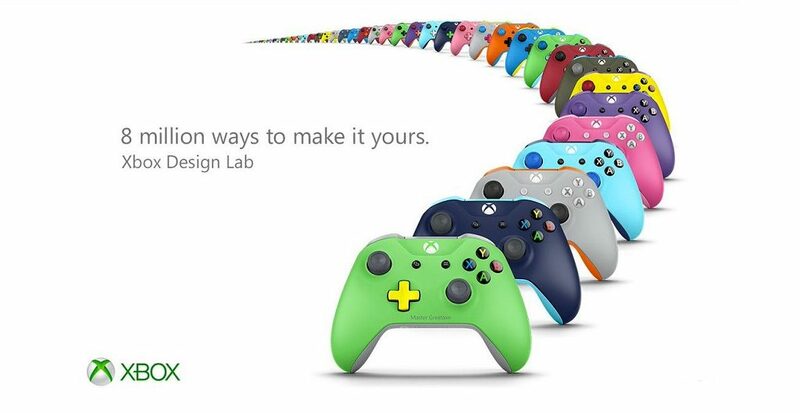 Microsoft even has Xbox Design Lab in which you can completely customize an Xbox One controller. Final word of advice is to go with the Xbox Elite if the person is a competitive gamer as it is much like the Steam controller in that it has additional buttons and can be customized a variety of ways. With the introduction of numerous Virtual Reality headsets in the past few years, this is the latest rage in the gaming world. Personally, I think this still falls in the early adopter category as VR has yet to be utilized widely by games and developers. That is rapidly changing based on this Polygon VR article about E3 2017, but in the meantime your options are limited. There are currently just a few VR Headsets I’d recommend and desired most by gamers. The two most popular headsets are made by Oculus and HTC, as well as one made specifically for the PlayStation. The video below does a great job of highlighting the three and what makes each great or different from one another. It is important to note that not all PCs are capable of utilizing a VR headset. This is due to the increased graphics requirement to operate the device. Each system will list the minimum PC requirements to operate the headset. These requirements are typically quite a bit higher than a typical PC. Every PC on our list below is capable of running a VR device and fortunately, prices are much more affordable than when VR was first introduced. PC Gamers typically favor the HTC Vive experience over the Rift but you really can’t go wrong with either. If your gamer has shown an interest in a VR system it is certainly something they would be excited to receive as a gift. Gaming PCs are a hot topic in the community and there are a lot of folks that prefer to build their PC sourcing their components for their specifically desired specs. It is also usually cheaper to build your own gaming rig but I realize not everyone has the time and skill to do so. Luckily there a few affordable machines that are know to the community that posses both great specs and are quality. There are just a few things to know when looking for a gaming PC. Each component is only as strong as its weakest component. A powerful processor will be meaningless if you have the weakest graphics card. CPU: Processor handles all of the processes and is measured in speed (Ghz) and cores. Higher speed and more cores usually being better. GPU: Graphics chip found in the graphics card. All of those things combined will determine what games the machine is capable of playing or what graphical setting they can be played on. Aside from those components, things like SSD or solid state drive will give you faster load times of all of your programs and games. Now, pick one of the PCs below that is in your budget and gift away! These are great builds and capable of playing all of the current games at medium to high settings. While gaming PCs are experiencing the fastest growth in popularity, hence the term “PC Master Race”, consoles still have their place. There are convenient, easy to setup, and do not require a ton of knowledge to just pop in a game and play. They do what they are made for with incredible ease. The great thing about consoles are they can do more than just play games these days, they can now act as a media hub for your living room. Gaming consoles also have exclusive content that is not available outside of their system which is another reason a they may be a great choice if the gamer is a huge fan of one of these console exclusive franchises. Fanboy-ism is a very real phenomenon so if you intend on getting the gamer a console, you should certainly try to find out which system they prefer but some gamers want every system and in that case, take your pick. Every console has its advantages and disadvantages and aside from trying to get some intel on preference, PlayStation is known for having great single player games as well as a huge library of exclusive games that are hugely popular. Xbox is known for having one of the best online eco-systems out of all of the consoles and has a hugely competitive online multi-player scene. Xbox does have it’s own library of hugely popular exclusives but lucky for the gamer, Microsoft is moving towards a unified gaming experience known as “Play Anywhere” in which you can buy games once and play them on both the Xbox One and PC. This is a win-win for the gamer! Finally, the Nintendo Switch is the latest in the Nintendo console lineup and it has received rave reviews for gamers of all backgrounds. Nintendo is universally loved and with new games like Mario Kart 8 and Legend of Zelda: Breathe of Wild that you can take on the go the Switch is hugely popular. Nintendo took a different approach with the Switch and that is making it more of a hybrid console that is both portable and capable of connecting to a TV. Whatever your choice, I highly recommend picking up a console bundled with a game! They are usually great deals and avoids the problem of a gamer getting a console with nothing to play on it. Aside from everything else I already listed there is a never ending list of items gamers would love to have. Below are a few more things that would be great to accompany any one of the items before or even just one or two of them alone. When buying gifts for your gamer boyfriend or girlfriend it is always a good idea to get something a little more personalized. It shows them that you care about them and took the extra time and effort to find them something just right! With a little thought you can get them a gift that they either cherish forever or at the least, never forget. One idea is take a look at all of the games coming soon and pre-order their favorite game for them. Even if they already pre-ordered it, you can try to surprise them with it before they have a chance to get their copy. I have heard so many stories of people getting surprised and raving about how awesome their partner is for doing something so thoughtful! One way to get them something more personal is to head over to Etsy and browse different seller creations like the one made by Kate’s Custom Crates! She creates custom pieces of popular games as well as other creations big in geek culture ! 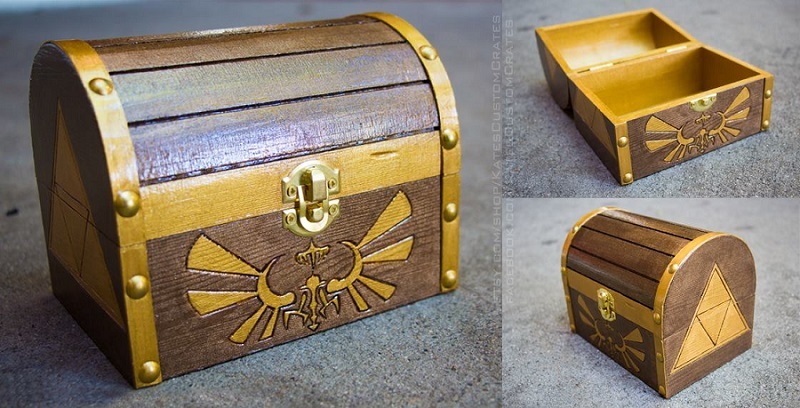 Below is a Legend of Zelda themed box that would be a nice addition to any gaming collection. To view more creations by Kate, head over to her facbook pag,e Kate’s Custom Crates. With plenty of options as well as custom designs you are certain to get something awesome and handmade. Gaming memorabilia is a great choice in gifts for your significant other because it is usually something that can be kept forever or at least for a long time. It is also something we gamers will probably cherish being big fans of the many different gaming franchises out there. Contains an unparalleled collection of historical information on The Legend of Zelda franchise. This handsome 280 page hardcover contains never-before-seen concept art, the full history of Hyrule, the official chronology of the games, and much more! Starting with an insightful introduction by the legendary producer and video-game designer, Shigeru Miyamoto, this book is crammed full of information about the storied history of Link's adventures from the creators themselves! This is one of the ultimate gifts for the Legend of Zelda lover. Filled to the brim with history and stories explaining the links between the many games. It also includes never-before-seen concept art and more and it sure to knock the socks off of any Zelda fan. This mana and health potion bottles are a really fun gift to give. Classic in game items, health and mana go together as well anything. What cooler way to celebrate a relationship that splitting the two into keepsakes for each to hold on to. 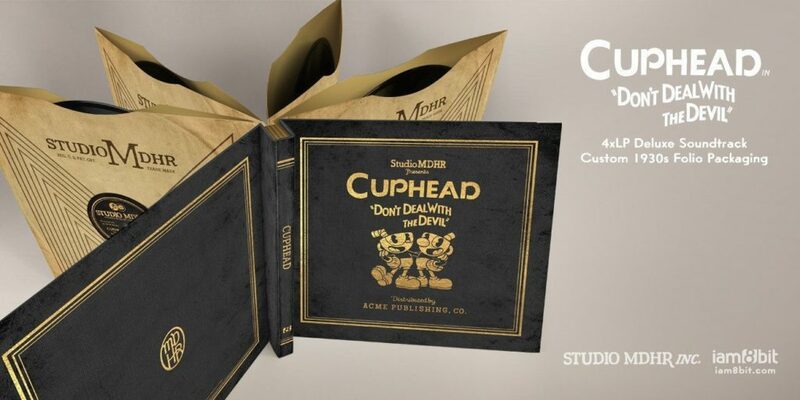 Collecting vinyl albums has become extremely popular and what better gift for the vinyl loving gamer than the soundtrack for his favorite game! Retailers like iam8bit and Mondo have a great selection of game soundtracks for both classic titles and new releases. While your at it you can browse their selection of other gamer gifts like apparel and other collectibles. 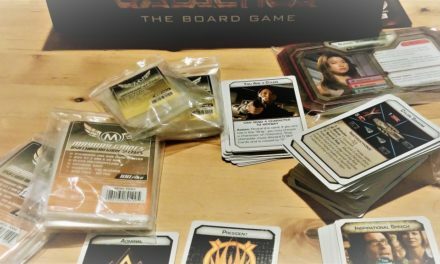 Tabletop games are more popular than ever and not just games like Dungeons & Dragons, Pathfinder, Edge of the Empire or other RPG adventure games! More and more game creators are launching tabletop game Kickstarter campaigns which are some of the most successful campaigns ever on the platform. 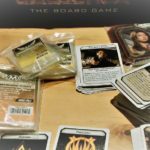 If you know someone who really loves table top games here a some of the top items you can gift and they will certainly love you for it. Usually, there are a few mainstay items every tabletop game will use and most can be used across most games. Find some in your budget and make a gamer happy with any one of these awesome tabletop gaming gifts. Just about every tabletop game on the market will utilize dice, whether is uses D6 dive or a Polyhedral Dice set. 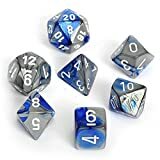 Most gamers will have multiple sets of dice laying around, whether for superstitious reasons or just being a collector. 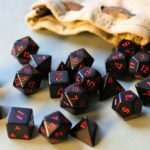 There are some really awesome looking sets of dice but gamers are also looking for accurate dice. Below are a few very popular options popular among tabletop players. To learn more be sure to check out our RPG dice guide! Q Workshop is a dice maker well know for their themed dice sets. They have many different collection made from both metal and plastic. They are considered to be pretty fair and accurate as well so you wont have to worry about them just collecting dust because they don’t roll fair! BAG OF DEVOURING: The Completionist's Dream: no more random draws, and no more partial sets. Contains complete sets of all 20 Wiz Dice Series II: Alchemic Oddities colors, guaranteed! 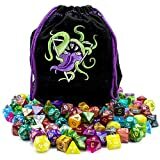 This Wiz Bag of Devouring is an awesome option for Game Master or Dungeon Masters out there. With 20 complete sets in this bag, you can be sure to have enough sets when you are hosting a group of friends. 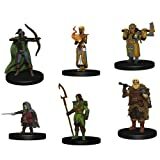 A great quality set to have as backup or for larger game nights. Chessex dice are widely considered to be some of the most accurate and fair game dice out there. GameScience is another option as well which has different color options available. Pick a set in their favorite color and watch them roll away! Dice Towers are a great addition to the table, no more chasing after dice rolling off the table. Not only are they great at containing dice rolls, they look cool to and can be found with some awesome theme elements from popular RPG games. This dice tower is great quality and being able to watch the dice tumble down to the tray is pretty neat. This tower is on the larger side, though not obnoxiously large, it isn’t the most portable tower. A great pick none the less. 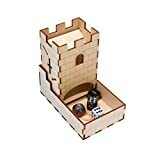 Roll dice in style with this exclusive wooden dice tower kit. Folds for dice storage and transport. 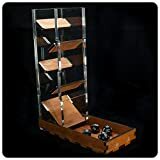 Great portable dice tower that is very convenient for travel and taking along with you to the next RPG adventure meet up. This tower is capable of folding down to a compact foot print. 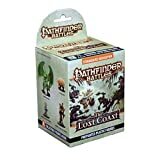 Miniatures add a nice element to RPG and D&D games and while they certainly aren’t required they are an excellent addition to the game. 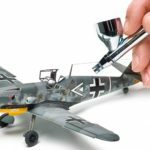 There is a whole universe of miniatures out there and even more so when you consider custom pieces but here are two great choices to start with. 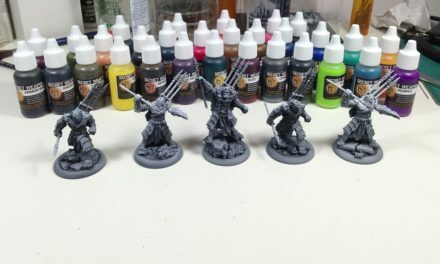 A well crafted set of miniatures that are affordable and great looking paint. Great for a first set of miniatures. This set is made up of blind boxes so each box will be a surprise. 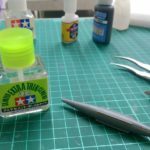 Wizkid is a well-known maker of licensed gear and are known for producing great quality, painted miniatures. The perfect set which includes most iconic character classes and races. What better way to add a miniatures to your RPG adventures than to create your own. 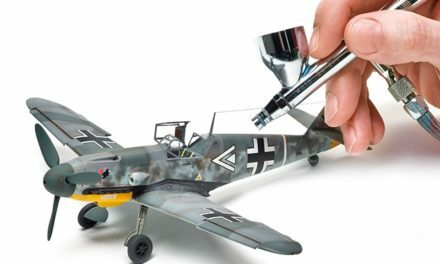 This miniatures kit is an awesome gift for the gamer that also loves creating. The kit includes 3 miniature blanks and 11 colors that you can use to put your own spin on their design. For the dice collectors out there, dice bags are great for organizing that collection. Not only are they great for organization they look cool! 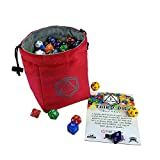 Nothing like busting out a cool looking dice bag and dumping your favorite dice out in front of your fellow RPG adventurers. 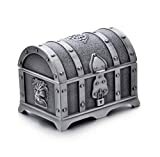 Great treasure chest look to display those same valued dice at game, definitely beats the Royal Crown bag. There is nothing like playing with an organized Dungeon Master and what better way to get them organized than equipping them with a Game Master Screen! The GM’s role is crucial for keeping the pace and not slowing things down during your adventures. A nice look GM Screen is an excellent gift for those Masters of the RPG world. 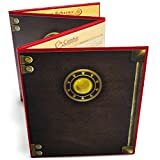 THE MASTER'S TOME: Take greater control of your campaigns with this fully customizable 8 pocket GM screen. A DM and GM essentia! WORLDBUILDING LORE: Sized for letter paper! Just print your notes and maps, or worldbuilding lore and art, and slide them in. Place campaign notes into 8 convenient pockets! If you really want to blow them away and they happen to be an RPG fanatic, a 3D printer is one way to win them over. For tabletop gamers into RPG adventure games, 3D printers make a great companion as they can begin creating their own custom game pieces. From dice trays and dice towers to D&D miniatures and more, a 3D printer will open them up to so many possible possibilities. If you are concerned that they may not know how to create the designs worry no more, with sites like Thingiverse which offers a ton of amazing designs you can download and print, it has never been easier. Pinshape is yet another site offering free designs to visitors. The FlashForge Finder is a great 3d printer that is highly rated and very affordable for 3D printers. It can print all sorts of projects with awesome detail. 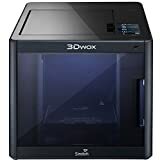 If your budget knows no constraints, the Sindoh 3DWOX is a very reliable filament type 3D printer that is very easy to use. The qulaity of printed items is also top notch. 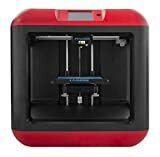 It is know as one of the best ABS 3D printers on the market and costs much less for what you may expect from printers of this quality. Now that you are loaded with ideas we hope you have a less stressful time and more fun experience! Be sure and let us know if this helped out and be sure and share it far and wide so others can get the inside tips.